First study of its kind reveals which pediatric medications are common candidates for taste improvement and the flavor options parents and children choose most often. A parent’s ability to choose how their child’s medicine will taste plays an important role in increasing pediatric compliance. FLAVORx, the U.S.-based medication compliance and adherence company, recently unveiled a groundbreaking study at the 3rd annual European Paediatric Formulation Initiative (EuPFi) Conference held in Strasbourg, France. The study, based on millions of data points generated from use of the proprietary FLAVORx Online Formulary, examined the real-world demand for taste improvement of pediatric liquid medications. 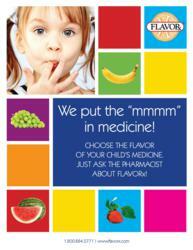 In addition to identifying which pediatric medications receive the most requests for taste improvement in U.S. pharmacies, the study also shed light on the flavor options that parents and children choose for their medicine. The study, titled “Improving the Palatability of Medications to Help Children be More Compliant”, shows, for example, that amoxicillin, amoxicillin/clavulanate, and azithromycin are common candidates for flavor choice and taste improvement. Grape, bubblegum, and strawberry are three of the more popular flavor options in the U.S. market. The poster also includes information related to physicians perception of taste as a barrier to higher pediatric compliance and reiterated the positive findings from compliance studies previously performed using the FLAVORx Pediatric system. The EuPFi is a consortium of 14 institutions working to improve pediatric drug formulations from a safety and compliance standpoint. Its members hail from academia, hospital pharmacy, and the pharmaceutical industry. Founded in 2007, the groups aim is to resolve scientific, regulatory and technological issues associated with pediatric formulation development. FLAVORx is a medication compliance solutions company based in the Baltimore / Washington D.C. area. They have been helping pharmacists help people take their medicine since 1994. Using FLAVORx's copyrighted flavoring recipes, pharmacists have safely flavored over 47 million prescription and over-the-counter medications for children, making it easier for them and their parents to deal with the stresses of being sick. Pill Glide, FLAVORx's newest product, expands their medication compliance focused offerings and continues the company's mission of improving lives and health-related outcomes through higher adherence. For the latest company news, follow FLAVORx on Facebook.